Shooting for Miss Delaney #1 Spiced chicken thighs with roast broccoli salad | The kitchen is my playground. This wonderful pair of recipes came out in the April 2014 issue of FishHead magazine under Delaney Mes‘ My Kitchen column. She creates recipes, I cook and shoot for her. She lives in Auckland and I live in Wellington but in this day and age of email and DropBox, distance doesn’t matter. I can’t count how many times I’ve cooked Delaney’s spicy chicken thighs. It is easy to prepare and the chicken meat always comes out the way I want it. Roasted on the outside and tender on the inside. I have to go easy on the chili though. The boyfriend’s stomach has low tolerance on spiciness. The roast broccoli salad is also a regular on our dinner table. What I like best about it is I don’t have to hunt for ingredients outside my own kitchen. If you like quality + simple things in life, this salad is a winner. 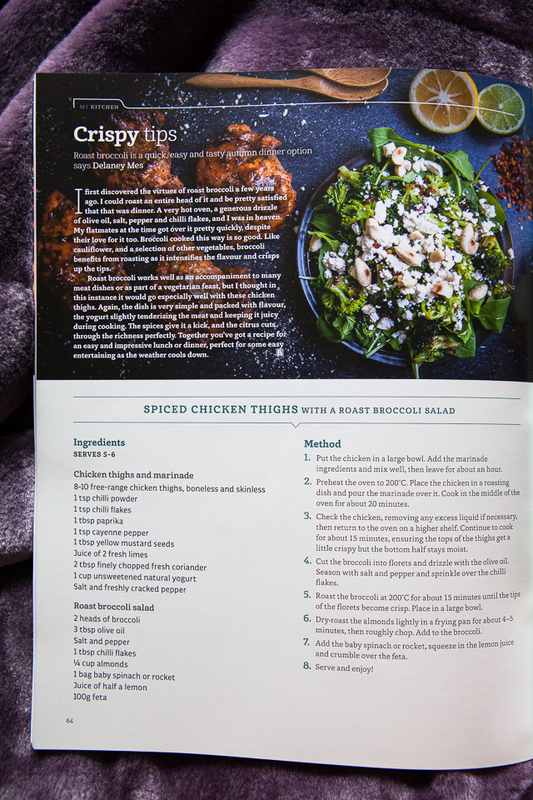 This entry was posted on Saturday, May 3rd, 2014 at 8:52 PM	and tagged with April 2014, broccoli salad, Delaney Mes, FishHead Magazine, My Kitchen, roast broccoli, spicy chicken and posted in Meat, Simple joys, Vegetables. You can follow any responses to this entry through the RSS 2.0 feed. What an appetizing picture, Miss Dolly! The salad is very intriguing as brocolli is one of my favorites. We would have to go easy on the chili too. As we say in America…”the apple didn’t fall far from the tree”! I have a recipe for Chicken Diablo that gets its heat from dry mustard, among other spices. I don’t usually make broccoli salad, other than occasionally drizzling it with Italian dressing. I will have to try yours, since I like anything with feta. I agree, Jovina. You can’t go wrong with feta.